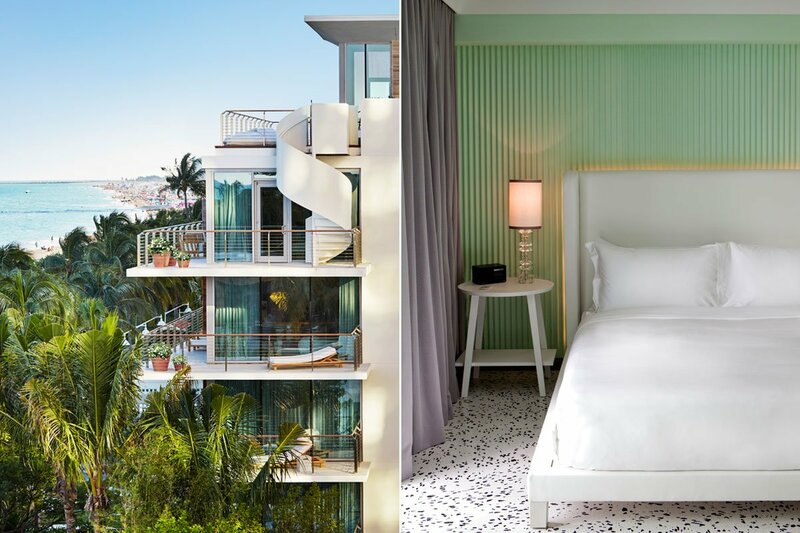 Left: The Miami Beach EDITION bungalows, Right: A room at Metropolitan by COMO. Photos courtesy of the hotels. Miami is topping our hotlist of hot places to travel in 2015 in no small part because of all the great new hotels that are opening. Contributing editor Christina Ohly gives us the rundown of four of the best new ones. MIAMI – Everyone and their mother is building or has recently opened a sleek, design-led hotel in South Beach. They all pay homage to Miami's rich architectural history, but differ slightly in tone, finishes, and food options. I spent a week in Miami checking in and checking out a few new hotels. Traymore restaurant. Photo courtesy of Metropolitan by COMO. Specs: A boutique bolthole from hotelier Christina Ong, the latest COMO is comprised of just 74 rooms designed by noted interior designer Paola Navone. Rooms are simple, spare, and elegant, and the in-house Traymore restaurant (so named for the original Deco gem in which it is housed) serves exquisite ceviches, brick oven pizzas, and straight-from-the-sea stews. Pluses: The intimate setting and the Zen spa make this place feel like a chic escape. There is no scene here. Unique Selling Point: The relaxing Indian head massage at the sleek spa. Also, the completely peaceful pool area which features the perfect mix of sun, shade, and gourmet snacks. This Place Is Perfect For: Anyone seeking a quiet, restorative long weekend. But Not So Perfect For: Those in search of late-night action or anyone on a tight budget. Rates: City rooms start at $269 per night. Click here for a reservation. Impeccable, chic rooms at EDITION. Photo courtesy of The Miami Beach EDITION. Specs: This just-opened "next generation urban resort" from Ian Schrager and Marriott Hotels occupies a sleekly renovated 1950s landmark on Collins Avenue in the mid-beach section of South Beach. 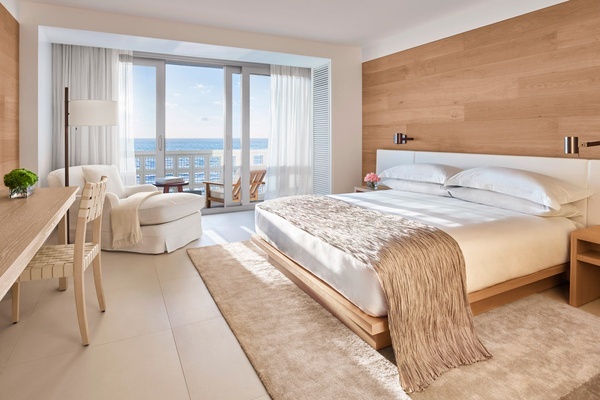 The latest of Schrager's EDITION hotels for Marriott (London and Istanbul are thriving) has 294 minimalist rooms and suites, many with breathtaking ocean vistas. Pluses: Everything is spotlessly clean, and white linens and neutral wood finishes abound. The staff — from room service to cheerful concierges — are eager to please. Minuses: It draws a slightly louder crowd — possibly for the disco bowling downstairs. Unique Selling Point: There are several. Market by Jean Georges Vongerichten serves delicious food 24/7 in a vibrant, open air space. The poolside restaurant Tropicale serves perfect shrimp cocktail in an Art Deco, bouganvillea-strewn landscape. But really, this place is such a one-stop hotel shop that you could bring an entire family here and find an activity, spa treatment, luxury suite, or amenity for everyone. This Place Is Perfect for: Art Basel attendees and start-up CEOs. But Not So Perfect For: Anyone seeking total quiet or anyone who prefers overstuffed chairs and chintz. Rates: Standard King rooms start at $349 per night. Click here for reservations. Read More: An interview with Ian Schrager about the EDITION collection. 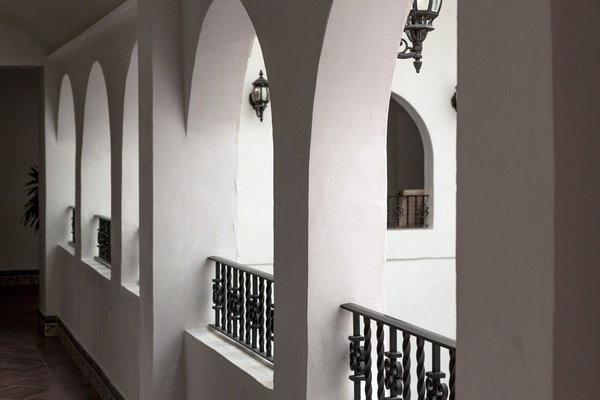 Arches around the hotel. Photo courtesy of Casa Claridge. Specs: Originally built in the Mediterranean Revival style, the 50-room hotel recently purchased by hotelier Alan Faena feels like a relaxed guest house — as well as an arts hub — a counterpoint to the Saxony Hotel and Norman Foster-designed apartments Faena is builing across Collins Avenue. Casa Claridge rooms have touches like Frette linens and bottles of Argentinean malbec, not to mention peace and quiet in plentiful quantities. Pluses: The atmosphere is sweet — think sophisticated house party — where people congregate in the main sitting room underneath a giant paper cut-out ceiling installation by Manuel Ameztoy. Minuses: There's no swimming pool and the bathrooms could use a sprucing up. Unique Selling Point: A three-way tie between the killer tuna tartare served on the patio, the rotating art exhibits, and the musical tertulias on Friday nights that feature guest curators. This Place Is Perfect For: Those seeking a low-key vibe on a budget. But Not So Perfect For: Anyone looking for bells, whistles, or bowling alleys (see The EDITION down the street). Rates: Casa Queen Rooms start at $129 per night. Click here for reservations. The garden area. Photo courtesy of Thompson Miami Beach. Specs: This 380-room beachfront spot captures the mid-century modern aesthetic through interior design by noted British tastemaker Martin Brudnizki. Rooms feel spacious: Many have ocean views, and more than 30 suites have expansive terraces, full kitchensm and living rooms. The furnishings are eclectic and more colorful than the stark, white environments found in neighboring hotels. 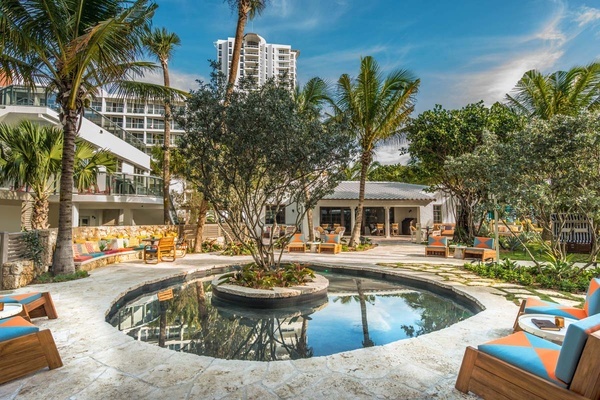 Pluses: The pool and garden areas are perfect for people watching, and the hotel's restaurant Seagrape is run by James Beard Award-winning chef and local food hero Michelle Bernstein. 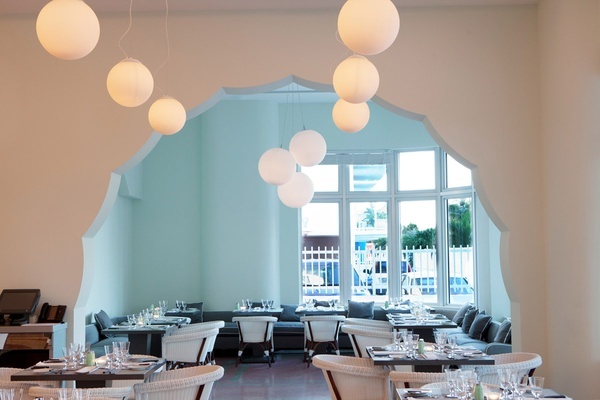 A Miami native, she plays to the area's seafood strengths in a relaxed, retro setting. Minuses: The lobby feels slightly strange — lots of dark colors and no clear sitting areas. Unique Selling Point: The tenth floor spa has lovely sea views and the Crown Room is the perfect spot for a cocktail connoisseur. This Place Is Perfect For: The younger set and fans of a slightly funkier design aesthetic. But Not So Perfect For: Anyone looking for a highly personal, intimate environment. In addition to these spots and others like Hotel Croydon and Circa 39, 2015 promises to be a year of spectacular openings. The two best to watch are Faena's Deco gem The Saxony and the very green 1 Hotel in the former Gansevoort space. Happy Miami. It's going to be a hot winter. See more hotel images in our slideshow.